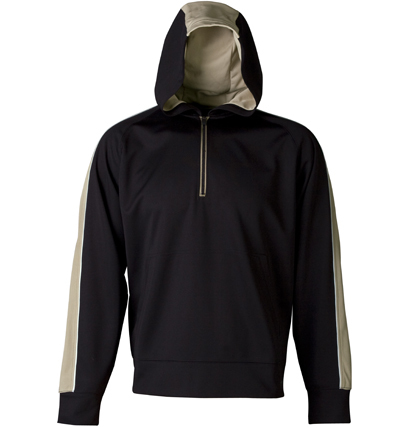 The Adventure Hoodie is a great promotional hoodie for sporting clubs and associations. Help your members keep warm and stand out with this hoodie. The Adventure Hoodie features 100% polyester lightweight Cool Dry fabric, a large front pouch to keep hands warm with shoulder stripes and hood panels. The hoodie is available in three colour combinations and in a large range of sizes. Suitable for both men and women, your sporting association details can be embroidered onto the hoodies. These hoodies are great for watching games during winter, training on those cool nights or when travelling for sporting carnivals and events. With comfort a major factor, the Adventure Hoodie is breathable and quick dry with yarn treated moisture wicking features. Whether you need hoodies for your supporter team wear or for the players to wear while training and travelling, the Adventure Hoodie is a great branded hoodie for men and women.